No matter which side each hero takes in Marvel’s second Civil War event, they’re more compelling if, even when they publically proclaim their belief in their side, they still have doubts. Captain Marvel 8 examines some of Carol’s own doubts in acting on Ulysses’s visions. That’s why, for the most part, this issue works so well. 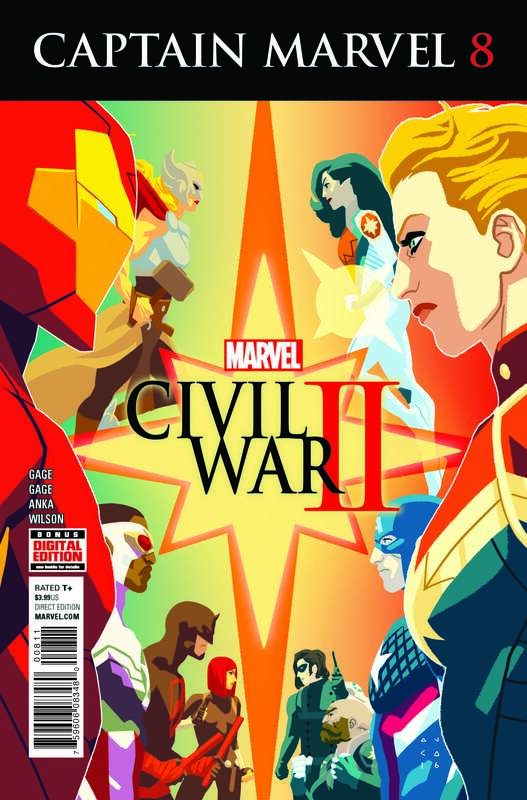 Written by Christos Gage and Ruth Fletcher Gage, Captain Marvel 8 starts with a montage of Carol’s teams taking out a bunch of very powerful threats, partly thanks to Ulysses’s visions. They end up saving hundreds of lives. It’s an effective way to open such an issue. Afterward, there are a lot of drawn-out conversations, most notably between Carol and Black Panther as they discuss how they’re examining each vision to ensure they don’t make mistakes. Although this comic gets heavy on exposition, the husband and wife writing team throws in the occasional joke to help keep this comic fun. The ending also presents an interesting situation where, while the threat Ulysses predicted would have killed people, it wasn’t entirely clear on who is responsible. It ends with a relatively innocent man being held by the police, putting his family in a difficult situation. The comic ends with a great scene where Carol considers her own doubts, which we haven’t seen anywhere else in her tie-ins. For the most part this comic is very good. That said, there’s a noticeable continuity error. Ms. Marvel is shown still excited to help Carol’s project, even though this takes place after the Hulk was killed. Kamala was already showing doubts before that happened, and the day the Hulk was killed, she clearly decided to switch sides. As fun as her moments in this issue are, this continuity error is distracting. The art by Kris Anka is great. There’s a clean look to everything, yet there’s also a lot of detail when there needs to be. The opening montage shows a great variety of superheroes joining Carol’s missions as they take on a giant monster, a group of supervillains, and the hand in three separate battles. Facial expressions do a great job at conveying emotion, like Carol’s fury when she’s talking with Hawkeye, the remorseful look on the former villain as he’s arrested at the end, and the contemplation in Carol’s eyes on the very last panel. The colouring by Matt Wilson is bright and colourful, with great use of reflections and shadow work. The only thing holding me back from saying this comic is great is the continuity error. The dialogue is great, there’s a good balance between story development, character drama and fun, and the art is appealing to the eye. If you’re reading Civil War II and at least partially agree with Carol’s side, this is definitely worth a look. This entry was posted in comic, comic review and tagged all-new marvel, black panther, bruce banner, captain marvel, carol danvers, christos gage, civil war II, clint barton, comic review, comics, hawkeye, Kamala Khan, kris anka, marvel civil war, marvel comics, matt wilson, ms. marvel, ruth fletcher gage, the incredible hulk, ulysses. Bookmark the permalink. This a great look at just how hard Carol wants to make it all work, and how much effort she’s putting into it, to be reasonable and responsible and prevent abuse. I also like seeing how, while she doesn’t have doubts, she does feel lonely, and feels like there’s no one she could talk to.